Every injection molding plant needs at least one expert troubleshooter. But too often, a plant has only one (or a few) really good “Go To” troubleshooters who can fix part defects and other molding problems. The training in The Expert Troubleshooter bundle will immediately give your company the ability to train as many expert troubleshooters as you need, on a continuous basis. Employees who make it through to our Expert Troubleshooter level are the true cream of the crop of injection molding experts. They approach molding “from the plastic’s point of view”. They know how each machine control affects the plastic conditions, the plastic’s behavior and the finished part properties – in that order. They not only fix problems, they fix them as efficiently as possible and keep your output and quality as high as possible. Build the Foundation. This robust new course has Paulson’s innovative SkillBuilder™ Lab lessons built right in. Each lesson has stunning HD graphics and videos, and teaches technical concepts in easily digestible segments. Students will learn the basic foundations of injection molding including the most important on how to process plastic from the “plastics point of view” (PPV). Paulson pioneered this method with the “Four Primary Variables” concept now widely adopted as the basis of teaching plastics processing. Optimizing the molding cycle for maximum productivity and profit is arguably one of the most valuable skills a professional molder can learn. The ability to shave a second off of cycle time, reduce downtime and improve quality with lower material usage should be a top priority for the key people on your production floor. This course teaches the molder how to completely control the process with SkillBuilder™ Lab lessons included! Expert level knowledge is vital to your success in today’s injection molding environment. 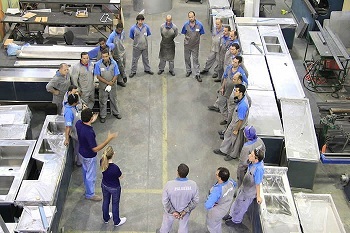 This means a commitment to developing an in-house system for training the best molders possible. The Expert Module builds in-depth understanding of the molding process. In short, it teaches the best of scientific molding from the plastic’s point of view. This course uses all of the training taught in previous courses and SkillBuilder™ lab lessons to teach expert molders the best troubleshooting techniques for solving the most common molding defects. A scientific, systematic troubleshooting method using the 4 variables and “from the plastic’s point of view” as the foundation is applied to the following molded part defects: Voids, Sink Marks, Short Shots, Flash, Weld lines (Knit Lines), Splay (Silver Streaks), Jetting, Burn Marks, Warp, Cracks and Part Breakage and Controlling Molded Part Dimensions. The course teaches not just the “how” of solving these defects, but the “why” as well. This gives your molders the tools to quickly find the most economical solutions to any part defect. The SkillBuilder™ lab lessons for the Problems and Solutions training program are some of the most important in the SkillBuilder™ library. Learning to fix molded part defects requires you to have a defect in the first place. But who has the time or money to mold bad parts and let your employees practice solving them. Only with our advanced injection molding simulation technology can you create part defects and let employees practice solving them using a variety of methods. There are usually many ways to solve any particular molding part defect, but only one that is most efficient. Simulation lets trainees explore various problem solving options without costing you time or money.